Kim Jong Un visited on Saturday the Pyongyang factory where North Korean cell phones are supposedly made, according to the state-run Korean Central News Agency. 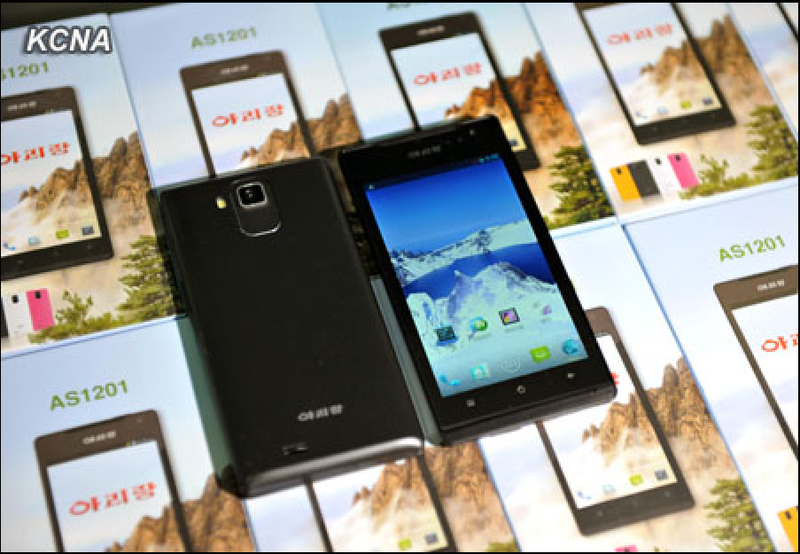 The Android-based AS1201 “Arirang” cell phone, reportedly produced by the May 11 Factory in Pyongyang. The visit came two years and two weeks since Kim Jong Un last visited the factory. That time he accompanied his father, Kim Jong Il, on a tour of a flat-screen LCD TV assembly line. At the time I noted the production line shown in TV coverage of the visit didn’t look much like those in a typical electronics factory and the same is true this time around. Workers are shown with finished products, inspecting them and testing them but no actual manufacturing is shown. Despite KCNA’s reporting that the handsets are made at the factory, they are probably made to order by a Chinese manufacturer and shipped to the May 11 Factory where they are inspected before going on sale. That will be all but confirmed if the handset shown in the photo can be identified. He learned in detail about the performance, quality and packing of “Arirang” hand phone being made at this factory. He highly appreciated the creative ingenuity and patriotic enthusiasm with which the officials and employees of the factory laid a solid foundation for mass-producing hand phones by building a new modern hand phone production process. He praised them for developing an application program in Korean style which provides the best convenience to the users while strictly guaranteeing security. After being told that “Arirang” hand phones which the factory started producing a few days ago are high in demand among people, he said he was also pleased as they are liked by people. Looking at the trademark “Arirang” inscribed on the hand phone, he noted that mass-production of goods with DPRK trademark can instill national pride and self-respect into the Korean people. How nice to see hand phones being successfully produced with indigenous technology, he said, adding it is of educational significance in making people love Korean things. He said that only when the quality of products is improved while boosting their production, people will like home-made things and they will be in high demand. — KCNA, August 11, 2013. A report on the visit was carried by Korean Central Television, but it didn’t show any video or still images from the trip. That’s true, although Kim Jong Il’s previous meetings with Naguib Sawiris, chairman of network operator Orascom Telecom, received widespread coverage in state media as did the switching on of the cell phone network. 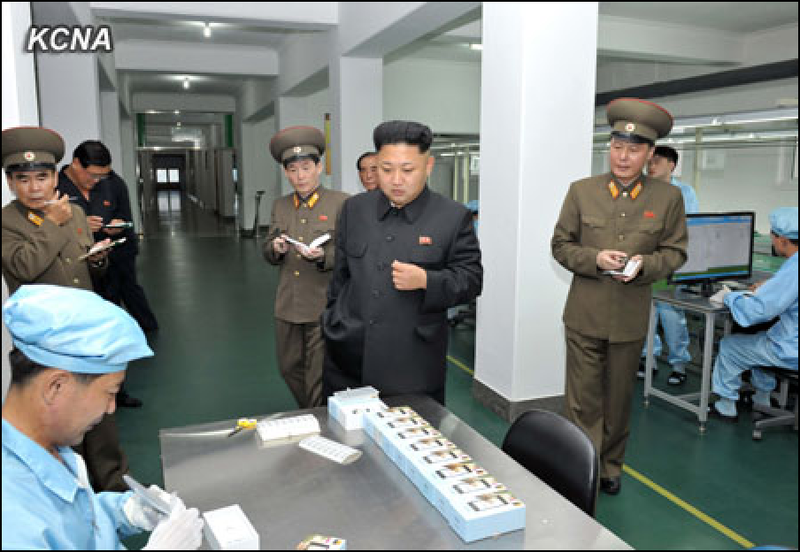 Kim Jong Un on a visit of the May 11 Factory on August 10, 2013. 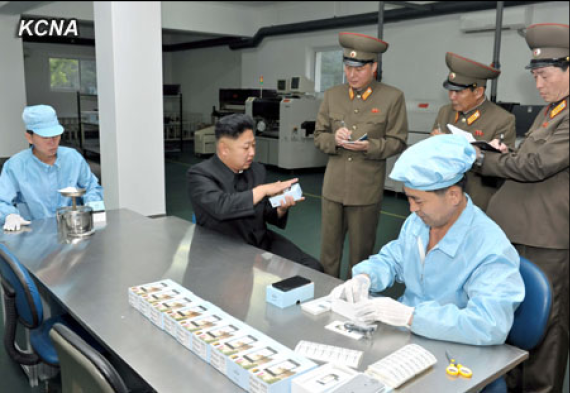 5 Comments on "Kim Jong Un visits ‘cell phone factory’"
This is a good innovation by North Korea. But I think they should have explored other untapped areas in technology instead of smartphone making..
obviously not for export market. Who would buy them.?? I like how the boxes seem to mimic those of the iPhone. That factory worker must be terrified……..
Arirang: el primer smartphone ensamblado en Corea del Norte | OhMyGeek! Kim Jong Un’s new smartphone | Uni-za.com site for your Life.